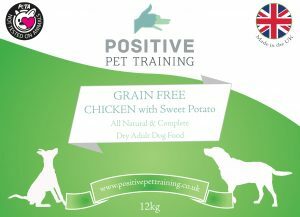 As some of you may know this year we have launched our own Positive Pet Training dog (and cat) food. This blog is talking about dog food in general but also explains why we offer the food that we do. Talking about what we feed our dogs is one sure fire way to get doggy-people into an argument. We really aren’t trying to tell you what you feed is wrong or right but just discuss the options we have with what we feed our dogs! Firstly, people can decide to feed professionally formulated balanced diets (wet or dry kibble or a mix of both) or homemade diets (where guardians make everything from scratch). The main downside to homemade diets (not including the extraordinary amount of time, money and effort to prepare it) is how difficult it is to macro and micro balance the nutrients required for dogs at different life stages. This means we risk malnourishing our dogs even though we are trying to do the best for them. For this reason I always recommend a formulated, balanced diet. One of the biggest arguments in the dog food is to feed meat raw or cooked. People say that eating the meat raw is closer to what dogs would have naturally eaten. We have lots of training and vet clients who feed their dogs RAW and who do really well on it. I would never dream of telling a client that they couldn’t; As long as it is a balanced whole diet. Unfortunately too many people unfortunately feel that raw feeding means chunks of meat in the food bowl and nothing else. There are however cases where it is highly inappropriate for them to be fed raw. If dogs have guarding issues, then the intensely high value of raw food for most dogs increases the risks of guarding behaviour developing or being displayed. I therefore feel with small children around this risk is never justified for any dog. And for a dog with history of guarding we should avoid raw feeding. Children crawling on the floor also increases the, albeit relatively small, risk of salmonella infection from the raw meat. One of the misconceptions around RAW feeding is that it keeps dogs teeth clean. In fact there is no evidence to support this. Wolves who do eat raw meat generally have awful dental health. Brushing your dog’s teeth daily or getting them to chew for 20 minutes a day are great ways to maintain oral hygiene but feeding raw is not. Grain Free diets can include raw or cooked meats. They tend to have higher meat quantities than feeds with grain in and therefore, are usually higher in protein. This means dogs are often fuller for longer, which can help with weight loss (when necessary) in some cases. Obviously wolves in the wild do not eat grains. But as dogs evolved along with humans they have evolved the ability to break down grains, with the enzyme amylase, which wolves don’t have. This means dogs can break down and gain nutrition from grains, but not to the same level that we can. Grain free foods are not carbohydrate free. They usually have potato or other vegetable supplying some carbs which obviously wolves also don’t eat in the wild but which are easier to digest. These diets can also suit some dogs who are generally sensitive in their guts or, obviously, any with specific grain allergies. Unfortunately, it is very hard to find any unbiased scientific food studies as they are often sponsored by a food company. Who, unsurprisingly, always wants the results to be that their food is the best. Personally I feel those who see huge benefits with RAW feeding may well see the same benefit on a grain free diet. By supplying our dogs with easily digestible, high quality food they can get the energy they need without having to work too hard. They tend to be pretty tasty too! Remember that not all grain free foods are equal. Some will bulk up with potatoes so that they do not offer a high meat meal. And, as with all diets, can vary from very low to very high quality diets. There is lots of fantastic advertising with dog food. It might surprise some of you that those with the biggest advertising budgets, those with adverts on TV at prime time, are often not the ones vets or behaviourists would recommend. Packaging can also be very confusing when looking for food with high meat quantities. They cannot lie on packaging but they can alter your perception of ingredients. In the ingredients list the most abundant items in the food have to be listed first. So you should always be looking for a meat component to be listed first. If they separate some items such as grains they may be further down the list but actually might be the main component of the diet. This looks like chicken is the main ingredient but actually maize totals 27%. So should be listed first and means there is more maize than there is actually meat! There are lots of tricks like this that manufactures use and so really look at the ingredients and know what is going into your dog. It is also important to remember that price alone isn’t a guide to the quality of the diet. A high cost food certainly does not mean the ingredients and composition are guaranteed to be high quality. But it is unlikely that you will find extremely high quality ingredients in a very cheap food as it is not financially viable. You should also be aware of the value of food to your dog! This certainly does not correlate with the price you pay for it. Some dogs turn up their nose to the most expensive diets available. For their everyday diet we don’t want the food to be too high value to our dogs (issues we have with RAW feeding). But we want them to enjoy it and this should always be one of your considerations when choosing a food for your hound. What we feed our dogs can hugely affect their behaviour and health. A food which is perfect for one dog may not suit another. I always recommend avoiding multi-coloured food as these colourings are added for your benefit not your dog’s. They can’t see colour in the same way we can. These can have similar effects of certain colourings on young children and send dogs hyper-active. Which isn’t something we want for our pets. Monitoring your dog’s faeces are a great gauge to see how it is suiting their gastro-intestinal tracts. If you are ever not happy with what your dog passes then talk to your vet. Take a sample, or at least photos and list the colour, consistency, smell, frequency and volume. Us vets really do want to know lots about your pet’s poo to help with diagnosis. So our Positive Pet Training dog food is cooked meat, grain free, high meat content (minimum 42% meat), high quality PETA approved meat sources. We offer dry kibble in 12 or 2kg bags as well as wet trays (great for stuffing Kongs!!) all in a range of meat and vegetable varieties. If you’d like to compare the food you currently feed and read more about other foods and a helpful unbiased scoring of commercially available foods check out All About Dog Food. This is a great website with fantastic resources going into much more detail than we can here in one blog post. Our grain free food is the same as Pero grain free on this website and we’re happy to supply ingredients list if you’re interested! Generally, when we change dogs onto a new food I would recommend doing this gradually. Especially if you know your dog has a sensitive stomach. Start by adding a little of the new food to their current diet e.g. 80% (old) 20% (new). Over a week or two gradually change these percentages until they are on 100% of the new diet. 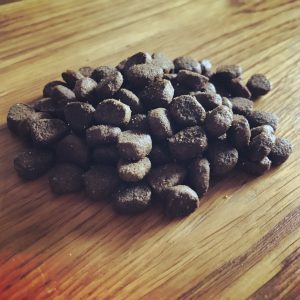 It can take a good six weeks to really see the benefit of the new food in a dog so as long as they are enjoying it and passing normal faeces stick with it and see how they get on rather than chopping and changing very quickly. If you’re local to us and want to know more about our food get in touch or talk to us during training or vet visits. We’re always happy to discuss food impartially. We feed our own dogs on our grain free food but have brands in all price ranges we would recommend for different cases and specific for your dog! Delivery to the local area is available. Other clients pick up during visits to our Positive Pet Training Dog Academy in Whiston, Staffordshire.